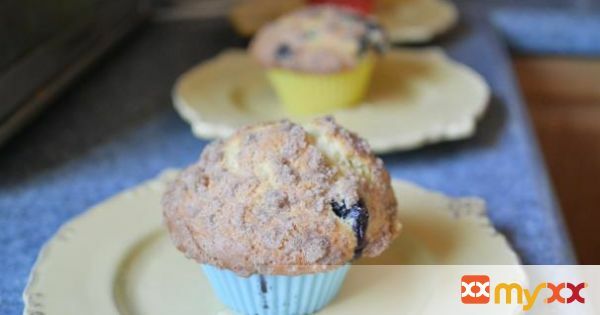 Buttermilk Blueberry Streusel Topped muffins so buttery and sweet you don't even need to add butter they melt in your mouth! 1. Preheat oven to 425 and line your 12 cup muffin tin. 4. Measure out the wet ingredients and pour them on top of the dry in the mixer and turn on low until they are just combined. 6. Divide the batter into the 12 cups evenly, they should fill up to the top of the cups. Add streusel topping and bake for 5 minutes at 425, then lower the temperature to 350, keeping the muffins in the oven and bake another 10-15 minutes or until a toothpick inserted in the top comes out clean, the tops should be a nice golden brown.